Mom sent me this picture of our tuckered out little girl. Apparently sleeping in the big girl bed isn't as restful as the crib. Or she is going through a growth spurt. Alyce sleeping through lunch time doesn't bode well for the afternoon nap, but naps have been few and far between lately so you take your breaks when you can. 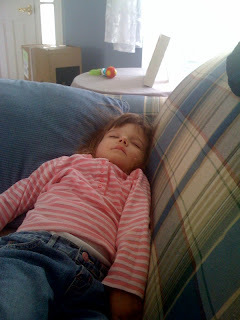 0 comments on "Tuckered Out Little Girl"